There are several types of headaches; dull and aching, tension, migraine, cluster and those caused from heat exhaustion, allergies, medication, injury or illness. Finding the root of the problem can help in relieving the headache, maybe all you need is a beverage, food or rest. Try these first and then move on to these other remedies if after sufficient rest you are still in pain. I suffered from migraines since I was child, then when I was first married I began working for a chiropractor. One of the perks was free adjustments, so I was adjusted at least 2 times a week, sometimes more, and after two months of this I realized I was no longer getting my monthly migraines. It was an amazing feeling and still to this day I will only get a migraine every once in while and I am able to kick it by applying an amazing blend from my oil distributor (email me privately for more info.) So what I am suggesting is if you are a chronic sufferer of migraines (or headaches), a consistent visit to the chiropractor is what I would recommend. Believe me, it will be worth every penny to not suffer with those migraines on a regular basis! And for those run of the mill headaches a trip to the chiropractor could only help. Remember that every person will react to a home remedy differently. What works great for one person will do nothing for another, so here is my collection of headache remedies I have collected over the years. Lavender Sachet - lay down and apply to head or neck, keep in freezer for best results. Pain Salve - apply to the temples and back of neck as well as the area of pain. Raw Honey - dissolve 1 tsp. in a glass of warm water and sip at onset of headache. Repeat every 20 minutes. Apply either a cold or hot compress, depending on how your body responds. For me I have to have a cold compress, heat only aggravates the headache. 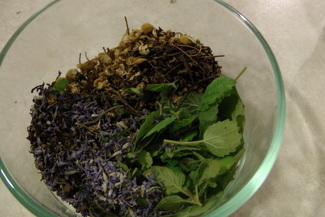 For best results use some of the herbs or essential oils listed below in your compress. Soak feet in as hot as you can stand water with a few drops of lavender essential oil - sip Headache/Stress Relief Tea sweetened with raw honey while soaking. Apply pressure to where the pain is for several minutes at a time - for best results use one of the essential oils listed below as well. Inhale, diffuse, apply to the temples, across the forehead and massage on the back of the neck. May also help to massage into shoulders and neck with a carrier.